I was really hard on the Stratford productions I didn’t like this year but it was actually a pretty strong season and the things that were good were Really good. This is them. Director Chris Abraham’s instinct to present classic texts in a contemporary setting is one of my top five favourite Chris Abraham things (see also: insightful casting, plenty of movement, smooth transitions, and great use of music). He cares more about the audience fully connecting Tartuffe‘s hauntingly evergreen themes to the horrors of our current global political climate than he does about appeasing ancient subscribers who would prefer their Molière delivered in silly wigs and confining corsets because “that’s the way it’s supposed to be done” (“supposed to” is surely the leading cause of theatre death in this country) and such clear-eyed priorities pay vast dividends in what might be the festival’s greatest production of the year, if not in years. Though they serve an interesting purpose in recontextualizing an otherwise too-happy ending, the Trump jokes that drench the play’s final scene are pretty cheap (especially considering this is not the only production at Stratford this year that stoops to this particular trope) and Ranjit Bolt’s boldly modernized adaptation sometimes dances too far over the line of modernity from effective shock (the contemporary curses dropped amidst the playwright’s poetic couplets are exactly the right kind of jarring) to silly overkill (references to sexting and emojis ring of “how the kids talk these days” desperation) but every other element of the production hits right in the sweet spot between wildly entertaining and deeply thoughtful. Graham Abbey is at his very best in a light, physical, and very funny performance with layers of ugly patriarchal rage that play for laughs then burst out horrifically when someone dares test the delusional bubble in which his spoiled Orgon resides. He verbally abuses Anusree Roy’s Dorine (Roy’s greatest performance to date- obnoxious and loud and relentlessly right), dismisses his righteous son Damis (a vibrant Emilio Vieira) and wise brother-in-law Cleante (insert my standard “Michael Blake is literally always good in absolutely everything” note here), and controls his admirable daughter Mariane (Mercedes Morris, standing her ground excellently in the ingenue role) with infuriating “because I said so” bullishness. The conscientious casting of performers of colour in these roles unlocks a discussion about the naiveté of privilege that’s never been so clear as it is in this searing portrait. 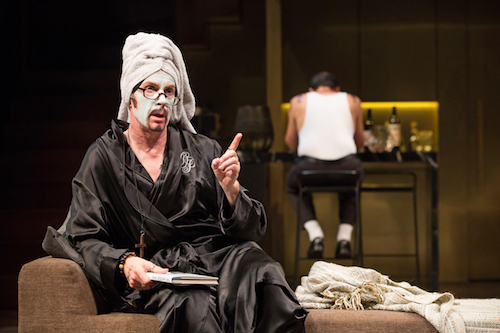 Here to capitalize on said naiveté waltzes in Tom Rooney’s delectably distasteful Tartuffe, a faux-religious skeezebag whose vague accent and stringy hair give off an unmissable Rasputin vibe. His abuses and corruption and general bullshittiness are so apparent you can’t imagine anyone could possibly fall for his lies (he even eats tic tacs with disgusting menace) but the omnipresent modernity of Abraham’s production wordlessly draws the necessary parallel to the great maddening “HOW? !” of our time (again, the unsubtle hammering home that happens in the final scene is gravy this production really doesn’t need). Rooney is pitch perfect and fabulously hateable in the role, at once totally transparent, seemingly unconquerable, and ultimately just a small-time hustler, a leech looking to take advantage of a society that’s too broken to notice how broken it is. The genius of Abraham’s production is that its title character is not its ultimate villain but rather a vile symptom of undiagnosed disease. That’s more like it! 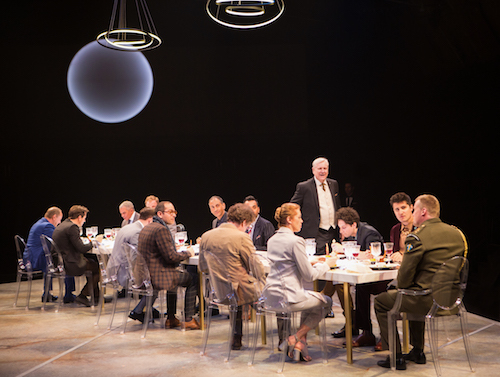 Director Stephen Ouimette’s modern, insightful, irreverent take on Timon of Athens is everything the other Shakespeare productions in Stratford this year are not. I tore Twelfth Night apart, and I really do hate doing that, but THIS, this is why, because Shakespeare can do this to your brain and your heart and we should demand that it does more often. The direction is swift and fun as Joseph Ziegler’s over-generous Timon flies high in the company of scores of hanger-ons; it’s wry and dirty when he loses it all. The production, and its hero, never loses its humour even as it resembles the saddest scenes of King Lear, our hero spiralling madly in the wilderness. There’s great allegorical value here- a quality heightened by the suggestive archetypicality of most supporting characters- but a deeply human character portrait lies at the play’s centre and Michael Spencer-Davis breaks through with an affecting assist as the one true servant of a man who thought he had hoards to count on. The ensemble could use more women (as most Stratford ensembles could) but there’s not much else to criticize in a production that makes a clear and palpable argument not just for the continued practice of producing Shakespeare but for the value of mining his lesser-known work because there’s many a masterpiece hiding in Hamlet‘s shadow and, boy, I’d really like to see them all. 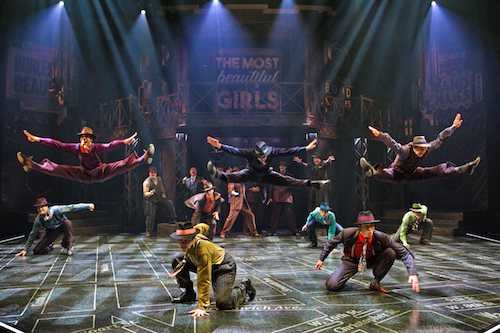 Donna Feore’s festival stage production of this overdone classic begins with a spectacular stage trick that perfectly sums up the production. Designer Michael Gianfrancesco has provided a beautiful background of black and white period marquees for the Broadway-set story and the capable ensemble flits about the stage entirely outfitted with grayscale costumes (Dana Osborne) and props as the overture plays. Lighting designer Michael Walton goes to a tight spot and, when the rest of the stage comes back to light, everything is suddenly in full colour. It’s a brilliant bit of magic. At the performance I attended (one where unfortunately Blythe Wilson’s much-lauded Miss Adelaide was understudied by a sweet but overmatched Bonnie Jordan), intermission served the same purpose as that tight spotlight. The first act drags- the ensemble dancing I was so looking forward to from superb choreographer/director Feore is slow and uncomplicated; leading man Evan Buliung, surely cast for his signature easy charm, is forcing his vocals; the deceptively challenging range of Sarah Brown’s vocals reveal the lack of blend in Alexis Gordon’s otherwise beautiful soprano; Sean Arbuckle as Nathan Detroit (the casting I was most excited about) substitutes a bad accent for character. Acting-wise, Gordon is a ray of sunshine with no-nonsense agency to spare (a rare interesting take on Sarah and a rare interesting role for Gordon), and perennial favourite Mark Uhre comes out of nowhere to steal the show as Benny Southstreet (a vaguely defined character whom I’m pretty sure has never stolen even a single scene before). His nervous Woody Allen-y take is hilarious, unexpected, and completely against type for the swoony tenor who here sacrifices everything from his perfect vocal technique to his hand-eye coordination in the name of injecting some fun into a dreary first act. At intermission, I was set to declare Feore’s attempt a disappointingly fine production (I probably would have also ranted a bit more about the state of musical programming at the festival because if I see another Guys & Dolls anywhere in the next five years I’m going to scream). But then act two began and it was like everything was finally in full colour. From Laurie Murdoch’s gorgeous rendition of the touching “More I Cannot Wish You”, past “The Crapshooters’ Dance” (the thrilling ensemble piece that makes the dull act one dancing truly baffling), straight through showstopper “Sit Down You’re Rockin the Boat” and onwards towards the finale reprise of the title number, Guys & Dolls became something I really didn’t want to end. The follow-up to Kate Hennig’s hit The Last Wife, The Virgin Trial tells the next chapter of the story for Elizabeth, Mary and Thom now that Henry VIII and Catherine are no more. It’s an engaging chapter in what will hopefully be a many-part epic, certainly the strength of this production keeps the audience wanting more. 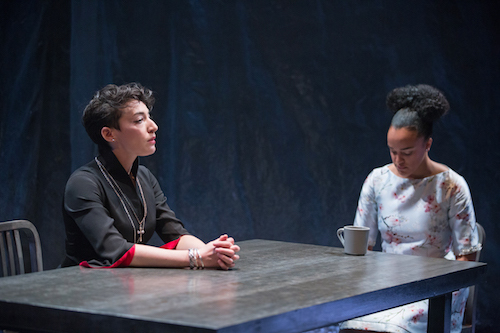 Director Alan Dilworth has never figured out how to execute a smooth stagehand-less transition in the festival’s studio theatre but Yannik Larivée’s enticing layered design helps him along and an excellent cast does right by Hennig’s delicious writing. Bahia Watson and Sara Farb return as the contentious future queens, the latter particularly wonderful in the role that won her a MyTheatre Award the first time around and is the perfect reminder of how powerful she can be when given the opportunity to play an actual grown up. Watson’s still doing her kiddie voice as teenage Elizabeth but it pays off in the power of moments when her youthfulness falls away to reveal glimpses of the legend she’s about to be. Brad Hodder replaces Gareth Potter as Thom for this instalment and plays the role with delicately balanced sincerity and manipulation, all drenched in the sort of charisma that can get a princess in understandable trouble. Hennig’s Tudor series is a welcome recurring feature at the festival- contemporary, bold, feminist, diverse and just plain good; it’s exactly what Stratford needs.